Ancient swords in China had various styles and sizes. They were normally constituted with a sharp tip and double blades. A sword is called Jian in Mandarin. It was famous for being the "King of Short Weapons" or the "Sovereign of Blades" in ancient times. 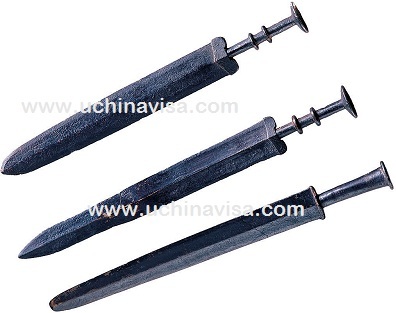 The Jian was first used in Shang times when bronze technology developed. Its usage was widespread during the Eastern Zhou Dynasty (770 BC-256 BC). Quite a few famous swords of great quality were made during this time. One of the famous places that produce brand swords is Longquan. A well known ancient master swordsmith is called Ou Yezi, who made a series of great swords, including the Sword of Goujian shown above. It's one of the earliest Chinese sword specimens. It is still extremly sharp after more than 2400 years in the ground. 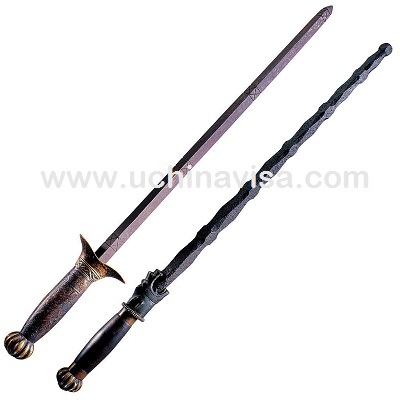 The following are some Chinese ancient swords.